Gardening in general is a tough hobby to get into. 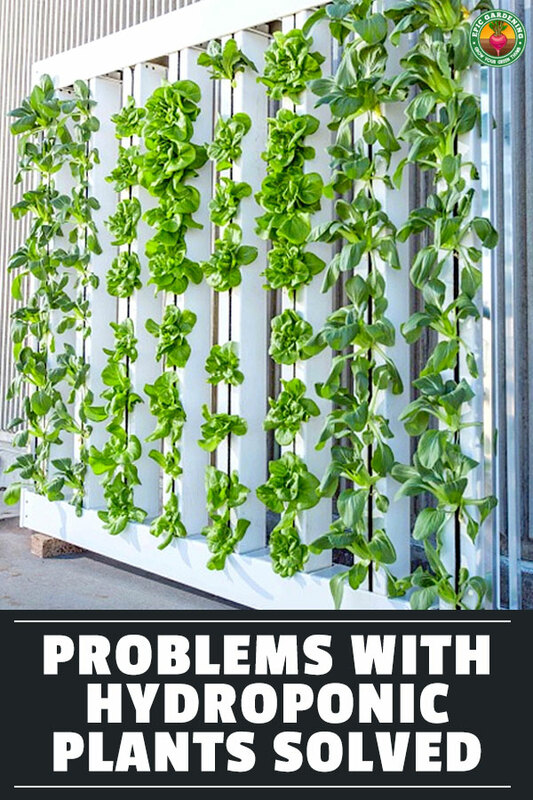 But when you take it indoors and start to experiment with hydroponics, it can get ever more complex. When I run into problems like this, I always opt for #2. Go with someone who’s done it before and can explain exactly what’s going on with your plant. This is almost always the better choice, because you’ll gain a deeper understanding of why the problem occurred. Before you Google it or ask a pro, you should see if you can solve the problem yourself. To do this, figure out all of the variables in your garden, how they interplay with one another, and if any have changed recently. What are the dimensions of your growing room? What type of lights are you using, and how many? 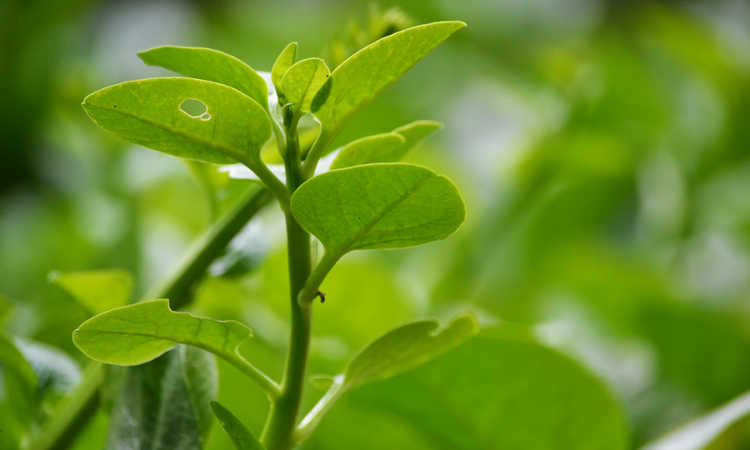 What growing medium are you using in the garden? What is the air temperature throughout a 24hr period? What is the temperature of your nutrient reservoir? 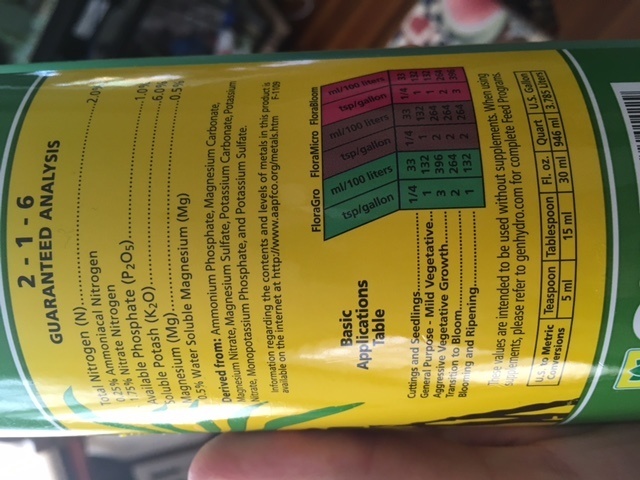 What is the PPM / EC of your nutrient solution? 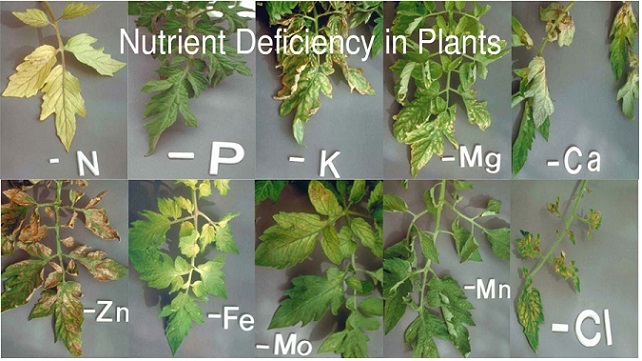 What type of nutrients are you using? 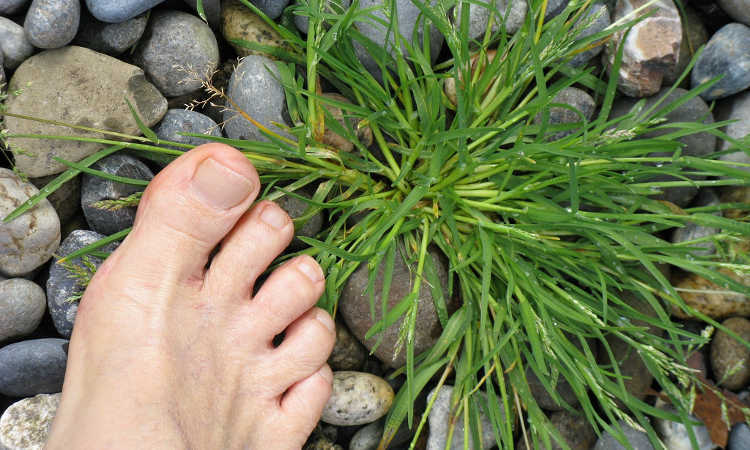 Can you describe, in as much detail as possible, the problem in your garden? What was the exact date and time the problem occurred? 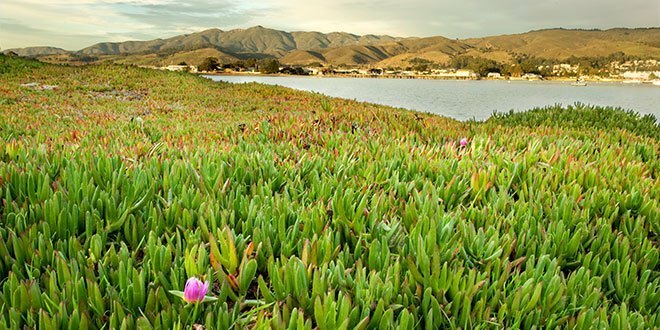 Where are your plants in their lifecycle? How many plants are affected? If more than one, did it happen all at once? 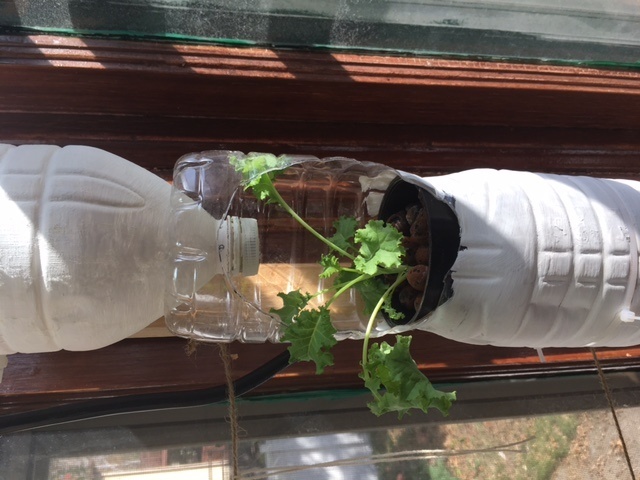 What part of the plant is affected (leaves, roots, stems, etc)? Are there any pests on the plants? If so, where and what? 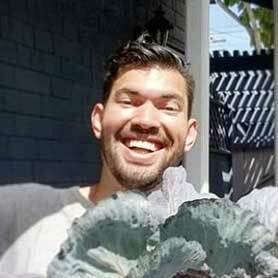 In the last 24-48 hours, have you changed anything in how you care for your plants? There are many more questions to ask, but you’ll find that answering even some of these may cause you to realize the solution to your problem yourself! Asking these questions also forces you to more deeply understand what you are doing and how you are growing, so you can avoid mistakes in the future. Regards.myself momin from india,west Bengal,dakshin dinajpur district. I have a small kitchen garden,but now i am thinking for bigger. I want to set a 100 to 300 vertical pipe(4″&10′ each)garden. I want to set sprinkler driper (0to70lph,adjustable flow rate)to the system.I want to set 12vdc pump.I have tank 4’depth in earth so pump would have to pump approx 15feet. now the problem is that i could not understand what will be the capacity of the pump,or whether more than 1pump/single pump should be set,how plumbing is to be done,what will be the diameter of pump outlet pipe&connectionpipe. I am facing problem all about watering. so,here is a request,please show me light & guide early as possible. Wondering if i can get some help with this. 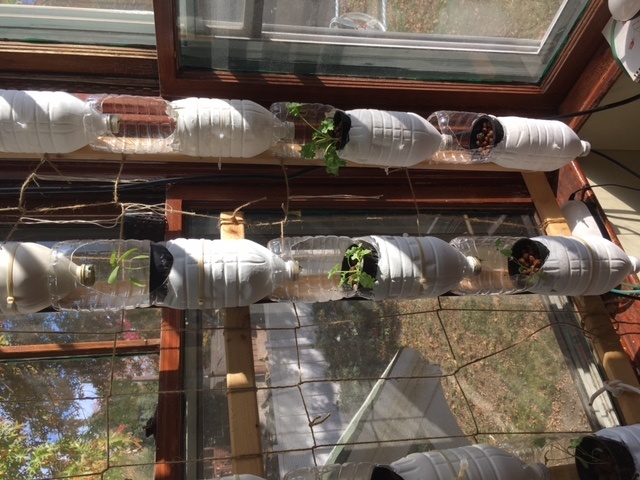 I set up a hydroponic window farm about 8 months ago and am having so much difficulty getting anything to grow. i have 4 columns with 5 bottles each. nutrient solution is aerated with air stone and waters columns for 30 minutes, stops for 1 hr and then repeats. 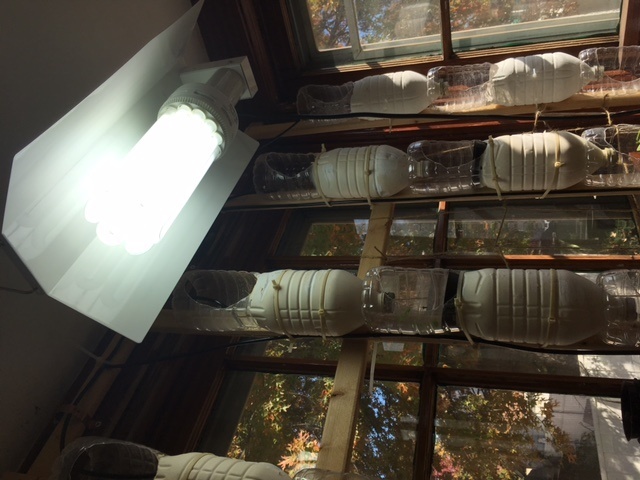 I am using a powerful cfl grow light that is on for 7 hrs a day plus the window gets direct sunlight at certain times of the day. 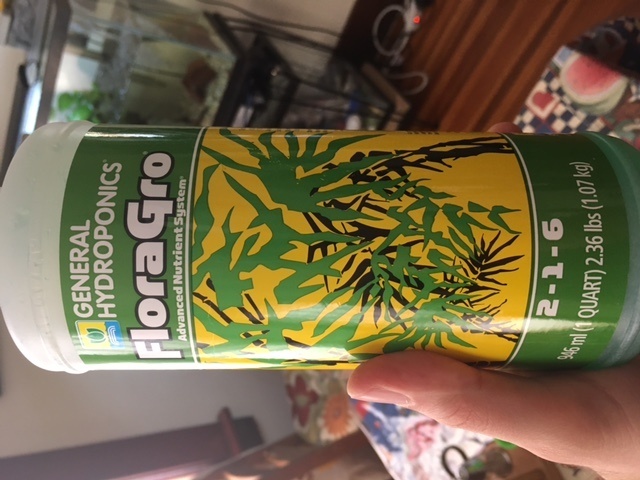 i am trying to grow non flowering plants (herbs and leafy greens) using ‘general hydroponics – flora grow solution). I add about 2 teaspoons of the nutrient per gallon of water. 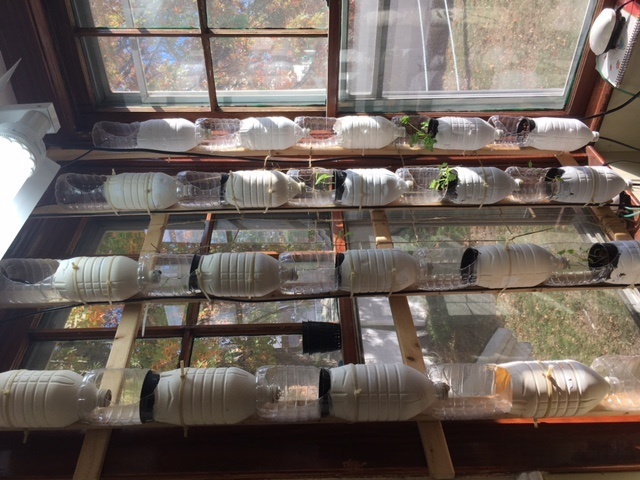 I started my plants from seedlings in a plastic egg carton and move them over to the system. 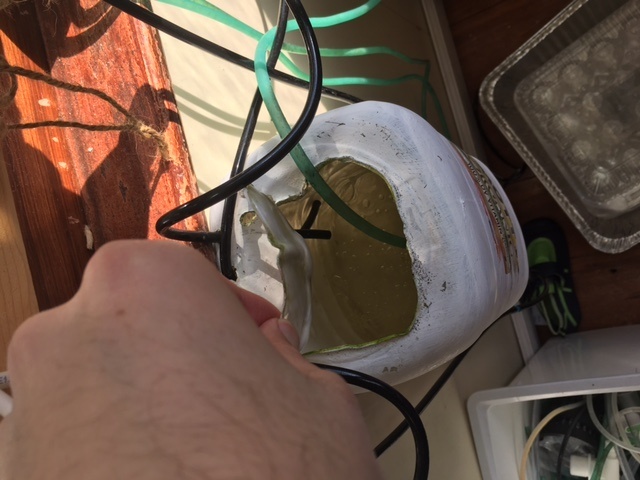 the plants are started in a peat moss plug and then put into a hydroten grow medium (plug included). 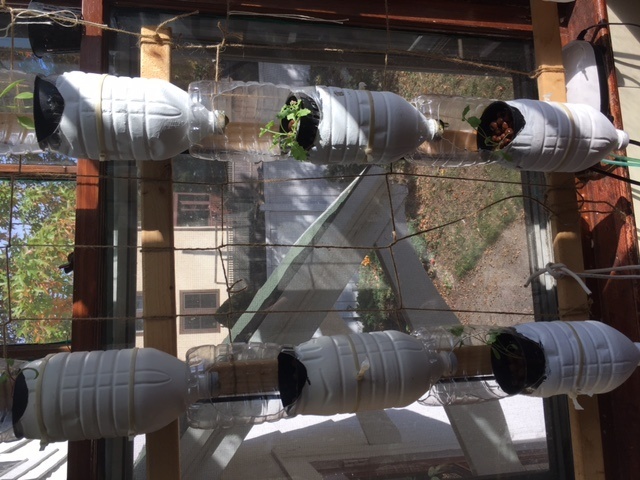 Currently i am growing basil, swiss chard, kale and cilantro, however they grow very slow (very little growth from week to week), grow thin stems the become weak and collapse. I have been trying trial and error, constantly improving on aspects of my system but nothing really seems to work. 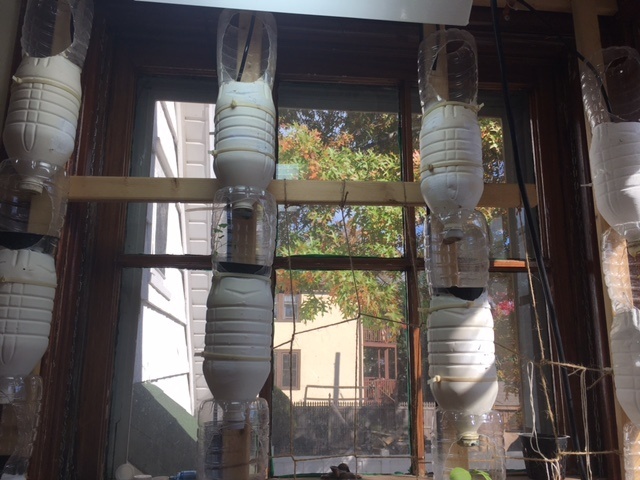 I have attached several images of my window farm and of the nutrient solution i am using. Any advice would be greatly appreciated.